This week marks four years since the Suitor first came a-courtin'. Usually we don't do much to celebrate--or anything, really--but in a break with our non-observance of previous years, this year we decided to do something about it. Or rather, I did, and he went along with it. Which is not to say that the Suitor was entirely absent from the process, and in fact he was the one who suggested what we ended up doing. We met in New Orleans (at a physics confererence--nerd love FTW! ), so the Suitor's idea was that we recreate, more or less, one of the meals we had there. The obvious choice--obvious because it was the most easily mimicked--was our lunch of muffulettas and Pimm's cups at Napoleon House. This being a weeknight affair, we had the sandwiches made at a local Italian deli using ingredients that were as close as possible to the "real thing." 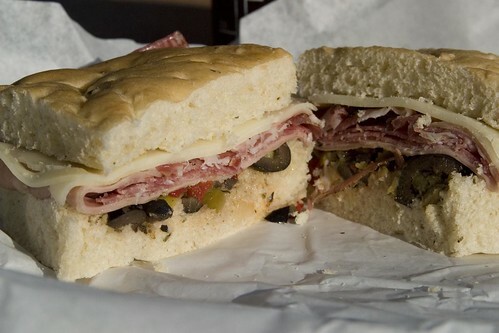 The muffuletta might be best known stateside as a sandwich from New Orleans, but in fact it's a type of bread from Sicily, and only came to be known as a sandwich because of the Sicilian immigrant who first served it at a New Orleans grocery store. The ingredients are more or less typical Italian charcuterie, so we were able to recreate the sandwiches to a fairly good approximation. Those, friends, are beignets: delicious bits of dough fried until puffed and browned, and then covered in a blizzard of confectioner's sugar. 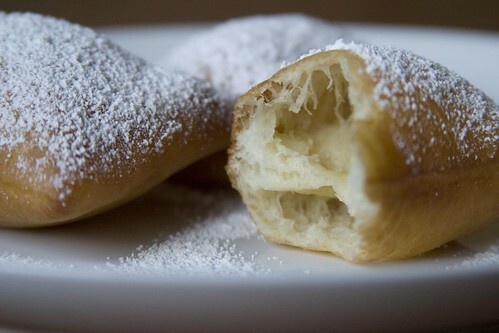 They're really just doughnuts, and technically the word "beignet" can be used to describe a variety of fried, doughy pastries, sweet or savory, with or without filling. But for me, and I suspect for a lot of people, the word conjures up not meat-filled pastries, but the simple, ethereal deliciousness of the plain sweet ones. And as it turns out, they're remarkably easy to make. All you need are a several hours' lead time, a frying/candy thermometer, and the guts to work with oil that's hovering around 360F/180C. Got those? You're all set, so see below the fold for some ingredients and instructions. Pour the water into a large bowl. Add about a teaspoon of the sugar, sprinkle in the yeast, and stir to combine. Let it sit for about 10 minutes, until it's slightly foamy on top. Add the remaining sugar and the salt, egg, and evaporated milk, and whisk to mix thoroughly. Add about 2 cups of the flour and, using a wooden spoon, beat until the mixture is smooth and uniform. Add the shortening in small pieces, and beat until it's well incorporated. Add more flour in 1/3 cup increments and beat the dough until it forms a soft, sticky dough. Flour a clean work surface, and turn the dough out onto it. With floured hands, gently knead the dough a few times, then place the dough in a greased bowl. Cover with plastic and refrigerate for at least four hours, or overnight. The dough should roughly double in size. When you and the dough are ready to proceed, pour the oil into a medium pot to a depth of a few inches, and affix a candy or frying thermometer to the side of the pot. (The sensitive bit of the thermometer should not touch the side or bottom of the pot.) Set the pot over high heat; you want the oil to reach 360F/180C for the frying. Meanwhile, flour a work surface, turn out the risen dough, and divide the dough roughly into quarters. 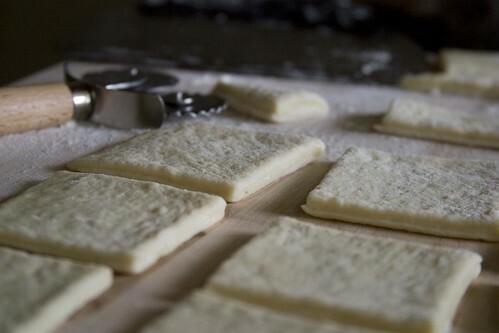 Roll out one of the pieces of dough to a thickness of 1/8 inch, and then cut it into rectangles 2 1/2 inches by 3 1/2 inches (or as desired). A pizza cutter works well for this task, as does a pastry wheel or even just a sharp knife. Don't worry if you have some irregular pieces; fry them up anyway, and either serve them with the perfectly shaped ones or--my preference--nibble on them while you work. Line a large plate or platter with a few layers of paper towels, and place it near the frying pot. When the oil has come to temperature, add 3-4 pieces of dough. Don't add more, or the oil temperature will drop too fast. Adjust the heat as necessary to maintain the right temperature. This might take some practice, so if you are concerned about presentation, I recommend frying the irregular ones first until you get the hang of it. 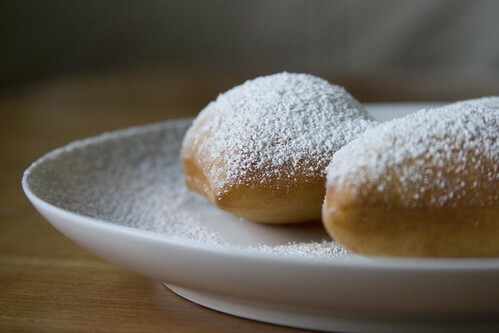 The beignets will rise to the surface relatively quickly, even before they start to puff. Turn them a few times as they cook, starting when they just appear puffed throughout the area (rather than only at the edges). This turning will ensure that the beignets don't puff out too much on one side. When the beignets are golden brown on both sides, use a slotted spoon or spider to remove them to the paper towel-lined plate. 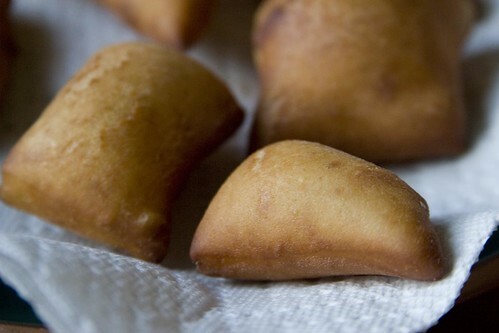 You can hold them at room temperature or place them in a 200F/90C oven until you have finished with the frying. Serve dusted with powdered sugar, lightly or heavily as desired. This recipe makes quite a few beignets (and this is half the original recipe), so don't feel bad if you don't want to use all of the dough at once. The dough keeps, covered and refrigerated, for up to 1 week. You can also cut out the beignets and store them in the freezer, in an airtight container and separated by layers of waxed paper, until you're ready to use them. 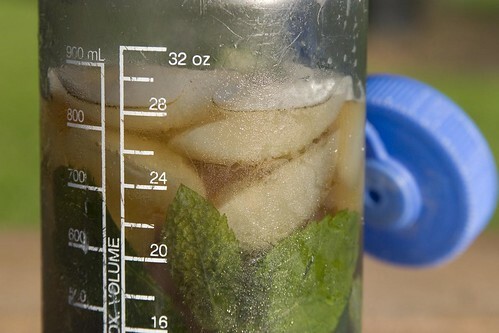 You are an excellent photographer --that Pimms cup (in a Nalgene bottle!) looks fabulous! Glad you had a wonderful evening with the suitor. 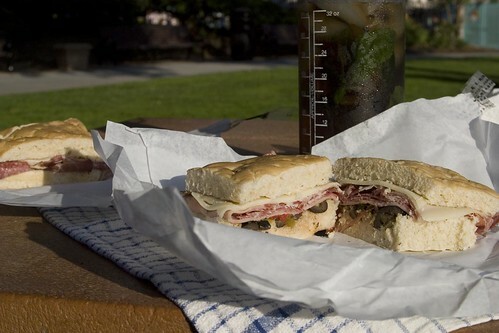 I don't usually think of the muffaletta as romance food, but this looks delicious. Happy Four Years. Thanks, all! The muffulettas really aren't romance food--it's the nostalgia that did it for us. And I think that picnics can be fun and romantic even if you're eating fried chicken. You know, the beignets really weren't greasy at all! I was surprised. It makes me want to experiment with other kinds of doughnuts (I have a weakness for cake doughnuts), but the last thing I need is to go on a doughnut-making kick! 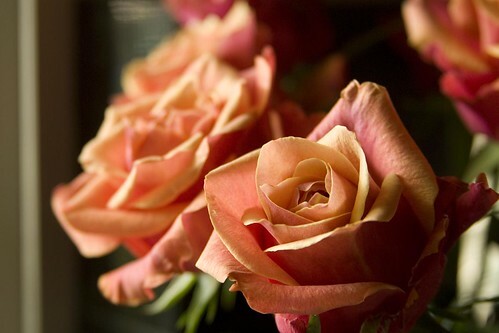 Thank you for the compliments on the pictures! The lens and setup I'm using aren't actually optimal for crispness, but perhaps the camera's resolution makes up for it. It's a Canon D60 from around '02 or '03, generously lent by my dad now that he has a Mark II for his own fun, with the stock 28-135mm lens--in image stabilization mode no less! I haven't been willing to remove the image stabilization training wheels until I get a tripod and/or improve the lighting situation. This lens has been good for playing around and hitting the learning curve, because of the zoom range and the fact that it can do some macro, but I understand that prime lenses (fixed focal length) produce sharper images. I'm looking at getting the Canon EF 50mm f/1.8 II lens, which seems to get great reviews and is more budget-friendly than most other lenses out there. A macro lens is next on the list, because close-ups are fun. Close-ups are indeed fun. I'm aware of my camera's limitations whenever I attempt them. Doughnut experimentation sounds like great fun . . . but I think that biscuits have done enough damage to me in the past year!